It was an action-packed day of sports, games and education this past September 24th as a group of Central Okanagan youngsters came together to learn more about how they can live with the medical condition they all share. Watching the group interact and play, one might not know that the kids, who ranged in age from 6 to 12 years, were all moderately to severely asthmatic. The goal of the camp was to educate the children about asthma, give them the opportunity to participate in supervised games, sports and other activities, and to share their experiences with other children who have asthma. The day also included a special education session for parents, featuring talks and a Q&A with a pediatrician, pharmacist, a Team Canada Olympic athlete living with asthma and a mother’s story to provide insight for families wanting to help their affected children. 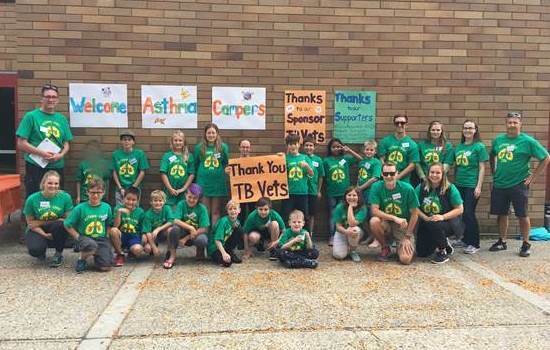 The Children’s Asthma Day Camp was funded through a generous $13,500 grant awarded to KGH Foundation by TB Vets as a way to provide a supervised education program for children and their families living with asthma. Held at Parkinson Recreation Centre, the camp was coordinated by Laurie Gilbert of the Community Asthma Care Centre at KGH and was specifically designed for kids suffering from moderate to severe asthma and food allergies.